We appreciate if you review our services at SL Marketplace! To appreciate your review and time you spend writing it, we add 1 free week to your subscription. Thank you for using our services, thank you for staying with SmartBots! Being new to Smartbot the support and service I have received so far is exceptional. SB Live Support was there with me as they walked me through each step in setting up my account to setting up my group notices. Their website was very easy to navigate. As a first time user it did not take long to figure thing out. I need a smartbot to send out ad’s in advertising groups and invite new renter into my land group. Smartbot did this job perfectly and was not difficult to learn how to start. 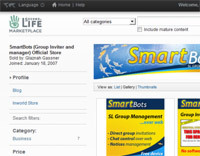 Thank you Smartbot for providing this service. Seiichi, thank you for your feedback! I’m proud to have you satisfied.